Earlier this past week I watched the documentary Rush: Beyond the Lighted Stage directed by Toronto-based film-makers Sam Dunn and Scot McFadyen. As heavy metal enthusiast (their previous films include: Metal: A Headbanger's Journey, Global Metal and Iron Maiden: Flight 666), in Beyond a Lighted Stage, Dunn and McFadyen look back at the 42-year history of what could arguably be considered Canada's all time biggest rock band - Rush. Be it their progressive stylings of the 1970s or their more synth-heavy sounds of the 1980s, the truth I have never been a Rush fan. 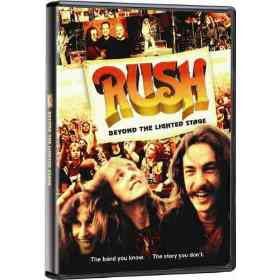 After watching Dunn and McFadyen's Beyond the Lighted Stage, however, I admit to possessing newly garnished respect for Geddy Lee, Alex Lifeson and Neil Peart (aka Rush). The film goes through the various musical life stages of the band using the commentary of fans as well as their fellow rock n'roll peers. It also delves into personal aspects of the band, with particular attention given to drummer Neil Peart's anti-rock star mannerisms and his family tragedies. The film is flawless film-making, leaving no stone unturned on the life of Canada's biggest power-trio. Well worth a watch and listen. Le Souffle du Désert (Desert Wind) - during 15 days 13 men (including some from Quebec) go walking in the Tunisian desert with the aim of reflecting on their masculine identities. last few days our group held a similar discussion about this subject and you show something we have not covered yet, thanks.